This is a small, erect and delicate of annual of arable and cultivated land, rarely growing above 15cm high. 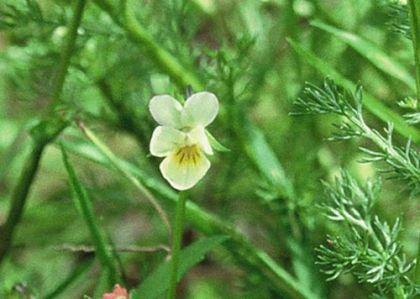 Its five-petalled, creamy-white face has a golden-orange flush on the lower petal and the familiar pansy lines run into its throat. The flowers, sometimes tinged with purple, are only 10-15mm across and are solitary. They bloom from April to October. The sepals are at least as long as the petals. The leaves are oval, deeply toothed but not heart-shaped. This plant is a native plant and belongs to the family Violaceae. 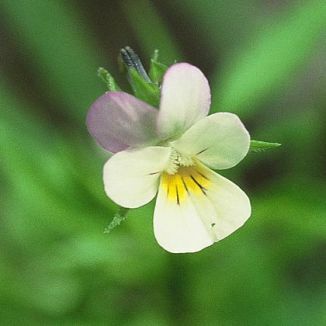 I first identified this little flower growing near Ballitore, Co Kildare in 2002 and photographed it there at that time.